Team Arrow is stunned to find that the new cat burglar who is running them ragged is a familiar face - Roy Harper! But Roy hasn't returned to his criminal ways but has instead been found out and blackmailed by a dangerous mastermind called The Calculator. Meanwhile, as Thea languishes in her sick bed (her refusal to kill now causing the curse of the Lazarus Pit to drain her own life force), Nyssa Al Ghul escapes from the dungeons of Nanda Parbat and Felicity prepares the presentation that will save or doom Palmer Technologies. It's a minor point and will probably be explained in later episodes but Calculator doesn't seem to have any motivation for his actions in this episode. More than likely he'll turn out to be a hired gun brought in by Damien Darhk but it's odd he didn't make some reference to it being nothing personal - he's just in it for the money. Katrina Law, as usual, steals the show in her brief scenes in this episode. Colton Haynes often didn't get enough to do on Arrow when he was a series regular. This episode ot only allows him more of a chance to play the smartass Roy from the comics - it gives him a chance to show some true character development. And it's always a treat to watch him and Willa Holland play off of each other. On the same note, Willa Holland absolutely nails her scenes here playing a slowly dying Thea. Tom Amandes nails the manic detachment of The Calculator from the comics. He just loves proving his intelligence and revels in the harm he can cause in an intellectual way. All of the action sequences and stunts in this episode are great, even by the standards of this show. This should be the episode submitted for consideration for the technical Emmys this year. The assassin who helps Nyssa escape from her cell and later travels with her to Japan is named Talibah, which means "seeker of knowledge" or "student". She first appeared as a supporting character in the Suicide Squad storyline in the Arrow 2.5 comic book series, where she was a school girl abducted as a child bride by the followers of the terrorist leader Khem-Adam. She was rescued by Sara Lance and Nyssa Al Ghul, and recruited into the League by Nyssa's father after being offered a chance to kill Khem-Adam. This may be the first instance of a character appearing in the Arrow tie-in comic before being introduced into the TV series. The first company that Roy Harper robs is Amertek. In the comics, Amertek is a military industrial firm that employed John Henry Irons - the engineer who became the technological hero Steel. The second company that Roy Harper robs is Cadmus Tech. In the comics, The Cadmus Project is a government-sponsored group - originally formed as The DNA Project - who engage in genetic research, including cloning and genetic engineering. Roy Harper says that he build a new life for himself in Hub City. In the comics, Hub City is the home town of the superhero The Question. Noah Kuttler, a.k.a. The Calculator first appeared in Detective Comics #463. In the comics, The Calculator started out as a petty criminal armed with a power suit that allowed him to create hard-light constructs. He fought several members of the Justice League, using his suit's computer and his own genius intelligence to devise ways of overcoming every hero after fighting them once. Later, The Calculator was revamped into an evil parallel of Oracle. Whereas Oracle offered technical support and information to the superhero community for free, Noah offered advice to super-villains at $1000 per question. He later become part of the inner circle of The Secret Society of Super-Villains during Infinite Crisis and took over leadership of the group afterward. He was revealed to suffer from Obsessive-Compulsive Disorder - a condition he normally controlled with medication. Katana is seen in this episode as the guardian of The Lotus and Nyssa remarks that being a member of The Crescent Order suits her. This is probably not related to The Order Of The Crescent, which - in the comics - is the highest honor that can be bestowed upon a foreign citizen by the nation of Kahndaq. This may have been inspired by a real-world honor created by Sultan Selim III of the Ottoman Empire, exclusively for honoring his non-Muslim allies. The first man so honored was Lord Horatio Nelson. It's worth noting that it was revealed in the Geoff Johns run of Teen Titans that The Calculator was the father of Wendy Harris - a girl who acted as tech support for the team in a capacity similar to what Felicity does for Team Arrow. Wendy was later paralyzed and sought out by the master hacker Oracle, who decided to mentor the young woman. The item stolen from Amertek is a network mapper - a piece of tech designed to scan all nearby digital infrastructure for potential vulnerabilities. Malcolm explains that unless someone restored to life by The Lazarus Pit continues to take lives, their own life force will eventually fade away. This is what is happening to Thea, since she refused to keep killing people. When asked why Sara Lance has not had the same problems Thea is having now, Malcolm explains that the ritual John Constantine used to restore Sara's soul also restored the balance. The item stolen from Cadmus Tech is a triode capacitor bomb. Felicity describes it as a tiny device which makes a really huge boom. Felicity determines that the network mapper and the triode capacitor bomb can be combined to create a web nuke - a device capable of destroying the entire internet. It would need a substantial power source to run it , however - one like the new power cell being developed by Palmer Technologies. The new Arrowcave contains a Faraday cage - a grounded enclosure used to block electrical fields. The Calculator equipped Roy with a contact lens in his right eye that acted as a camera/microphone. According to Felicity, it contains more computing power than the average high-end laptop. Felicity borrows a "battering ram" from Palmer Technologies - a program Ray Palmer developed that can be used to crash through cyber-security. Palmer Technologies new revolutionary item isThe Power Cell. It is an advanced battery that is 100% recyclable, capable of powering an electric car for thousands of miles as well as an entire high-tech skyscraper like the Palmer Technologies building. When Thea falls into a coma, her doctor says that she's barely a 3 on The Glasgow Scale, which is used to measure the intensity of comas. A Level-3 coma is marked by opening the eyes in response to verbal stimuli and uttering random words. The Lotus is an elixir created by the enemies of The League of Assassins to counteract the effects of The Lazarus Pit. Felicity: How is it that you always manage to blame yourself for everything? John: It's his super power. Guilt Arrow. Roy: I don't want to hurt you. Curtis: I don't want you to hurt me either! Curtis: Oh. I think you might need to hurt me, then. Roy: Maybe next time we can do something that doesn't involve me getting stabbed or shot at? Just an idea. Ollie; I'm sorry that I put you in this position. Roy: Pretty sure I put myself in this position. I remember you not being all that happy that I faked my death to protect your secret. Ollie: I never should have let you. Roy: Do you ever get tired? You know, carrying the weight of the world on your shoulders all the time? Ollie: (laughing) You sound like Feliicty. And Diggle. Felicity: I found a tiny flaw in the OS Code, I'm pretty sure I can exploit it to open a backdoor into his main computer system. Ollie: Right, but wouldn't that risk exposing us? Felicity: (pause) My pride that you understood what I was saying is slightly undercut by your lack of faith in me. Ollie: I have nothing but faith! Just do it. Felicity: (smiling) I already did. Calculator: Why would I want to take down The Net? Not only is it where I work, I'm addicted to funny cat videos. Calculator: If you want to make a statement, you don't take down a system - you take down a city. Thea: Ollie, that's insane! Not to mention stupid and... I can't let you owe Darhk a favor! Oliver: And I can't let you die! I won't. Thea: That's not up to you. I know how you take everything on... everyone's problems. It's one of the things I love the most about you. But you can't fix this one, Ollie. Oliver: I have to try. Thea: No you don't. It's my choice. It's my life. Malcolm: Oliver, sometimes the greatest act of love is no action at all. Felicity: I did get a look at his protocols though and if the web nuke goes on-line, he could kill 8,000 people. Calculator: I'd say that's a conservative estimate. Blowing the gas mains alone would kill 3,000. Just wait until you see what I've got planned for the subway cars! Arsenal: I'm the one who brought this maniac into your lives. I need to do this! This is my choice! It's my life. Roy: You know, I thought about staying anyway? For you. Thea: You know what you could do for me? Go live an amazing life. Get married. Have a couple of kids. Get a minivan. Just go be normal. There's nothing in this world that would make me happier than that. Roy: You know, if I could do all of this over again, I would do every single one of those things with you. Roy: I love you, Thea Queen. Thea: I love you, Roy Harper. Nyssa Al Ghul appears for the first time since 403. Malcolm refers to the events of 405 and John Constantine's restoring Sara Lance's soul. Thea tells Oliver about how Damien Darhk's death-touch in 407 temporarily stopped her blood lust. Ruve Adams - the new candidate for mayor - is Damien Darhk's wife, last seen in 410. Roy heard about Felicity's paralysis on the news. In the flashbacks, Oliver mistakes the Shado in his vision for Mei - the twin sister he met in 318. The vision Shado tells Oliver that he must learn to forgive himself and fight through his darkness. Katana appears for the first time since 322. Roy Harper also appears for the first time since 322. As the episode ends, Roy goes back into hiding. Felicity erases all the data Calculator had on Roy's new identity. In the flashback, Oliver tells Taiana the truth about how he was the one who killed her brother. It is revealed that The Calculator is Felicity's father. Thea is hospitalized with a coma. Nyssa offers to give Oliver the Lotus Elixir that might cure Thea... if he will kill Malcolm Merlyn. Nanda Parbat and Kyushu, Japan. We don't get to see precisely how Nyssa talks down Katana. Ollie's going to go chasing after a burglar in his street clothes seems mindbogglingly stupid, given that he's in the middle of running for mayor. One of the best episodes of the season so far. Everything is firing on all eight cylinders here and the only real weakness to the episode is that you wish they'd had more time to explore certain aspects of the script, like nearly all of Nyssa's subplot. 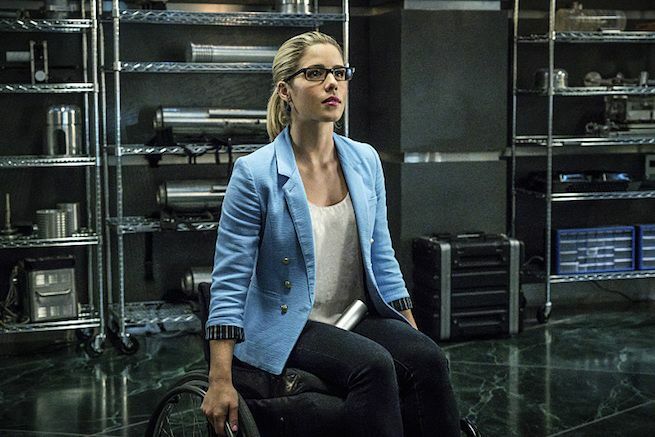 We could have done with more of her and Tatsu and less of Felicity feeling unconfident because of her wheelchair but those scenes aren't bad - just a subplot that could have been scrapped without depriving us of anything.